Its increased capacity offers fuel delivery for both stock 110 Hp and 160-180 Hp applications. The pump is rated at 400 KPA fuel pressure & 150 Liters per hour. The maximum current draw is 6.6 amps, and the rating is based on 14 Volts. 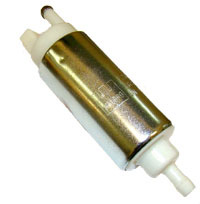 This direct "in tank" replacement fuel pump is for the Hydrospace S4. Please contact us if you need a fuel pump for other applications.